Mon - Sun 08.00 - 19.00. Till this day Nissi Water Sports have been updating their products every year, offering to our customers the latest and safest piece of technology. 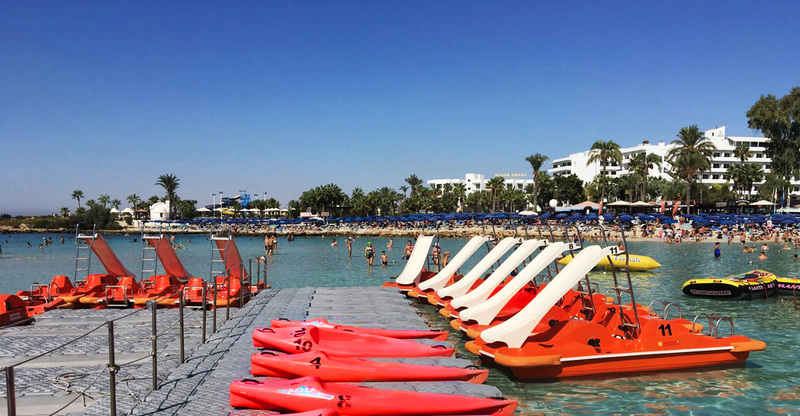 Getting stronger year after year the company was officially trademark 1991 and remains today as a member of the Cyprus watersports association and market leaders of water sports in Cyprus with an experience crew ready to provide to each and every one your holiday fun. 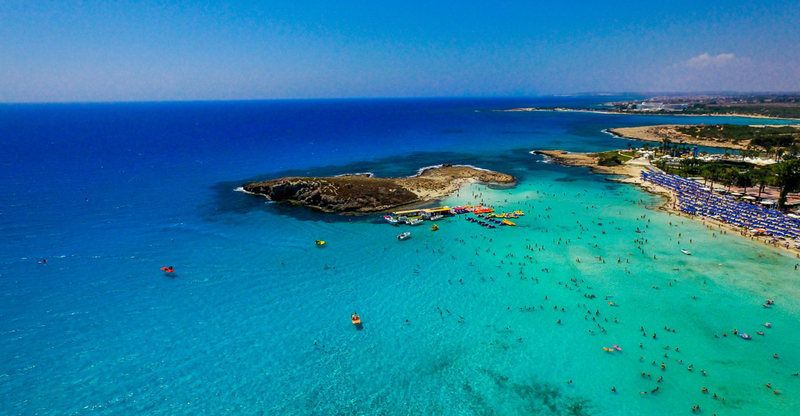 So enjoy the sea, enjoy the sun and enjoy Nissi Water Sports. we have made the most advanced, onstumizable and user-friendly sporty theme in the world. It’s never too late…..Regardless age, parachute is definitely one of the easiest and safest things you can try on your holidays. Starting from the back of a boat with an easy take off parachute gives you the unique feeling of flying. 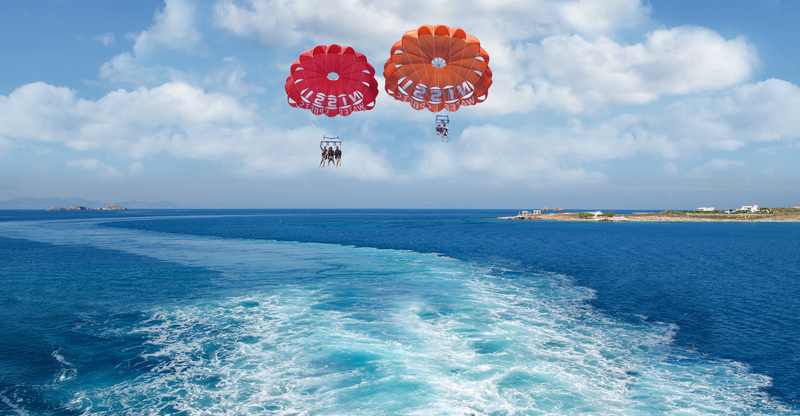 Take a look the city from above and enjoy the view and leave the rest to our experienced crew. Let 180bhp push your adrenaline to the limits. 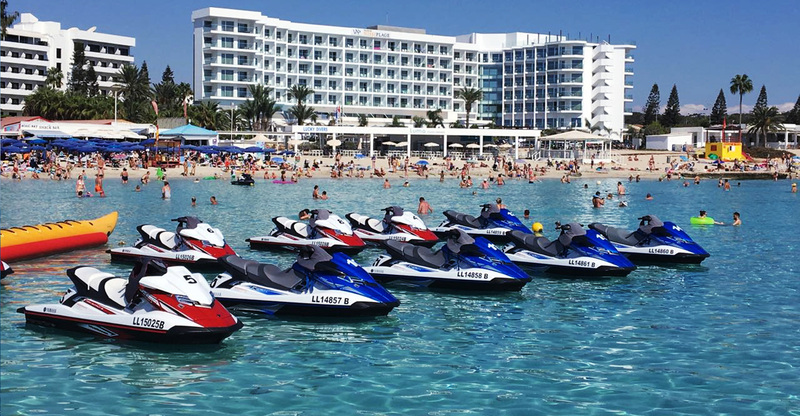 Jet skis are built for thrill and at nissi watersports we provide our clients with the latest Yamaha wave runners ready to meet our customers need for speed. If you are looking for something a little bigger to rent with friends and family then the jet boat should definitely be in your list of watersports. Like its name says (Jet Boat), is supplied with a jet engine of 135 bhp and five comfortable seats to make your journey in combine with speed ruff and smooth. Our 33 feet long high speed boats can take you and your friends or family on a cruise not to forget across Ayia napa. Stop and swim in the crystal clear waters of the Mediterranean Sea and relax. The cruises are available for one hour or half and the boats can accommodate up to 10 persons. 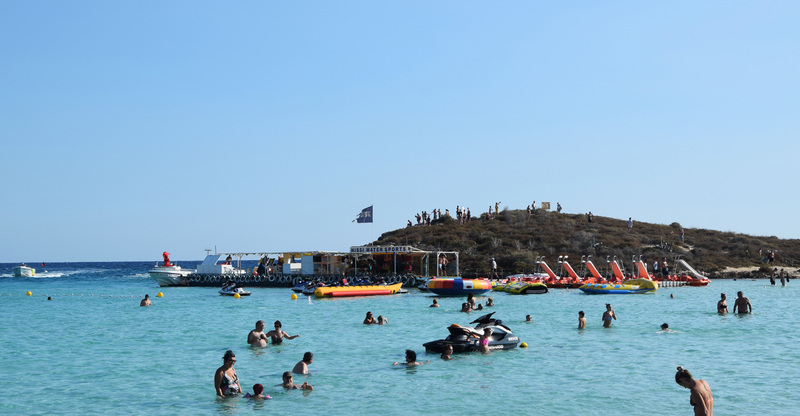 A cruise with nissi watersports not to forget. What is yellow, floats and fly? What ever u think it is, it s wrong, cause we are talking about the flyfish. If you think you are an extremist then definitely the flyfish is the one for you to boost your self with adrenaline. The aerodynamic shape of the flyfish attached on the back of a high speed boat takes 2 passengers at the time and lifts up in the sky giving a unique feeling. Well if you haven’t done this before then I think it’s about time you get your self to the nearest watersports now! The banana Boat is the longest running ride in watersports history. Attached to a speed boat, jump on the banana and let’s have some fun. Take it easy…that is what the pedal boats are all about. Pedal around nissi beach and make sure your taking your time because this boat is for slow cruising around the Bay. Pedal boats take up to four people and are supplied with fun slides for kids. Available single and as a double the kayaks can take you on a short safari around the area or provide you with the exercise you need for the day. Strictly not for lazy ones the kayaks could mean a lot of fun alone or with friends. Never done it before? No problem. Our experienced crew will teach you all the steps to take your first feeling of walking on the water. A trainer will take it one step at a time and teach you the basics of waterskiing. It is safe, extremely fun and… twists! the only one towable that can TURN and TWIST on the water!